Parehong pasok sa timbang ang dalawang regional champion na si WBO Inter-Continental lightweight champion and no. 6 WBO lightweight na si Juan Martin Elorde at IBF Inter-Continental lightweight champion na si Isa Chaniev. 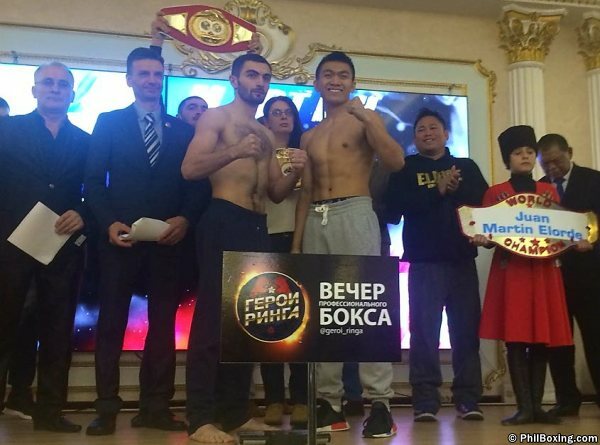 Juan Martin Elorde of the Philippines weighed in at 133.7 lbs while the tough Russian weighed in at 134 lbs. Ang dalawa ay maglalaban para sa IBF Inter-Continental Lightweight Title at vacant WBO International Lightweight Title bukas December 9, 2017 at Evloev Sports Palace, Nazran, Russia.